Hi everyone! It’s sneak peek time at The Alley Way Stamps and we are featuring the new May release. 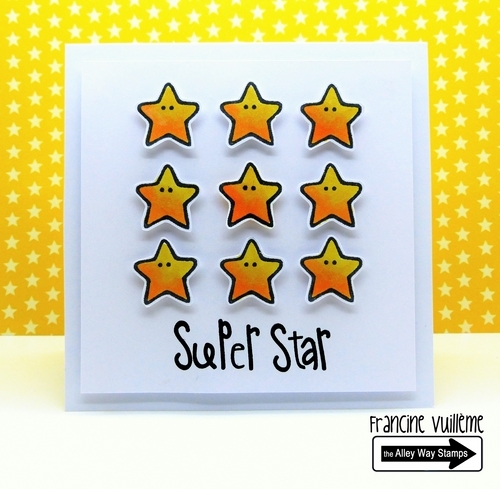 These little stars are so fun and versatile! I colored them with Copic markers, fussy cut and fixed them with 3D foam pads to the cardstock. The sentiment is from the Reel Time set. Be sure to check the TAWS blog for more inspiration and info on how you can win this stamp set. Don’t miss our blog hop on April 30th and the release day on May 1st! Trop choux ces étoiles! j'adore ce design! YOU are the SUPER STAR!!! Everything you make is so delightful and I commented over at Alley Way Stamps that this was my favorite card on today's post!! Awesomely done and love the bright, happy, positive message it sends!!! Une marque qui fait que tu te distingues. Oh, Francine, these are adorable, and I love the coloring!! Stunning with them popped up on the card! And I agree - YOU are the SUPER STAR! Hugs, sweet friend!